Google takes another stab at QR codes. Will it work this time? The American market may be quick to catch onto some things, but the adoption of QR codes has not been one of them. The two-dimensional bar codes, that point to a destination online when captured with a smartphone, have taken off in some markets (they’re huge in Japan!) but have not been met with widespread adoption stateside. This week, Google announced a broad plan to introduce QR code stickers in the windows of over 100,000 local businesses nationwide. Could this be the tipping point that imbeds the QR code in the American conscience? Well, that will depend on a few things. For starters, Google will have to get consumers to actually interact with the things on a widespread basis. The search giant is already trying to incite retailer interest by caling its program Favorite Places. The curated tone will likely encourage retailers to sign up for a spot on the list. Now if consumers start taking the bait, it could work. And Google might just end up cornering another digital marketplace. These two-dimensional bar codes have been trialed in all sorts of advertising campaigns, from print to stickers on all sorts of surfaces. Many brands — from Louis Vuitton’s use of Murakami to Esquire’s recent Sherlock Holmes tie in — have helped close the loop between the offline and online worlds. But as of yet, QR codes have not become a common occurence for American consumers. 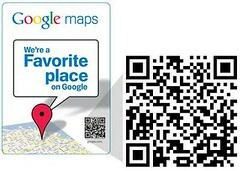 Google is hoping to change that with Favorite Places. 9,000 towns and cities across the country that will have a Google created (and QR enabled) sticker in their windows. in more real time information. It could also lead to more informed — and happier consumers. trials in which students could scan QR codes on outdoor print signage. But Google making a play in the space is no guarantee that it will take off. The search giant has made previous efforts with these square codes. Placing QRs in newspaper ads drove 6.5 times more revenue than the ads without embedded codes, but they still failed to deliver expected results, and Google killed the campaign this January. Now that consumers are quickly gobbling up smartphone models, it’s easier to find phones that can translate the codes. But the method of delivery is still unproven. Zagat’s established itself as a player in the restaurant business over a long period of time. Google does not have the same clout when it comes to restaurant reviews. And while smartphone users may be excited to scan a QR code on a window of an establishment that they’ve walked up to, that smartphone is the same reason that they can just as easily find out the information they want before they get there. Rupert Murdoch’s media empire produces news, but he also has a habit of making it himself. Most recently, he was a headline-creator when he stated he’d be pulling his websites out of Google’s index. Journalism in the 21st century is clearly something that matters a lot to Murdoch, both financially and personally. And in an op-ed piece in his own Wall Street Journal, Murdoch laid out his views on where he sees journalism going, and who needs to stay out of it. Verizon hit upon an ingenious marketing tactic when it started publicizing the new Droid handset. The company had been sitting idly by while AT&T made headlines — and millions — selling iPhones the past two years. But after doing a bit of research, they noticed that AT&T’s 3G coverage wasn’t as thorough as the company claimed. Now that they have a Google smartphone in their catalog of phones, Verizon decided to go after AT&T’s network quality, with comparative maps of their coverage. AT&T took none too kindly to the effort, and quickly responded with a lawsuit. This week, AT&T dropped its case against Verizon. It appears that Verizon has won this round of the cellphone wars. But when it does get its hand on the iPhone, there’s no guarantee that Verizon will have any more success delivering coverage than AT&T. AT&T’s exclusive contract with the iPhone should be up in the next few months. And when Verizon starts selling the iPhone, the data demands of the product could easily sink their network performance to below AT&T levels. But Verizon is betting that its network can take the street. The company thinks that network quality is going to be the most important — if not the only thing — that matters for cellphone providers pretty soon. If phone manufacturers keep producing products and marketing them directly to the public, that future could get here pretty soon. If Verizon can deliver on its promise, the company may have hit upon a winning strategy for the long haul. As social networking goes public, will users stop sharing? Social media matters to individuals (and subsequently marketers) because people trust information sent by friends more than data shared by strangers. But are moves to make social information public going to send people fleeing from sharing their information online?